Since I started uploading my logs to the ARRL Logbook of the World in November 2003, I've been working toward the DXCC Challenge. I've been carefully trying to work DX stations on multiple bands, hoping to get my current entity-band totals past the Challenge threshold of 1000. Well, sometime this weekend, I received enough confirmations to get me past the 1000 mark. At the moment, I have 1003 entity-bands confirmed. I guess I'll be submitting an application for the DXCC Challenge this year! That along with 30m DXCC. UPDATE: I also notice that I have exactly 239 current entities confirmed for Mixed DXCC. This means I'm exactly 100 entities away from working all 339 current entities, or 91 away from the DXCC Honor Roll. CP1FF QSL clearly shows 15m Phone. I recently uploaded all my logbooks to ClubLog, and I was trying to reconcile my DXCC credits with those shown in LoTW. While doing this, I noticed something odd. Back in 2009, I submitted a hybrid application for Phone DXCC using, 52 LoTW credits, and 10 paper QSLs. 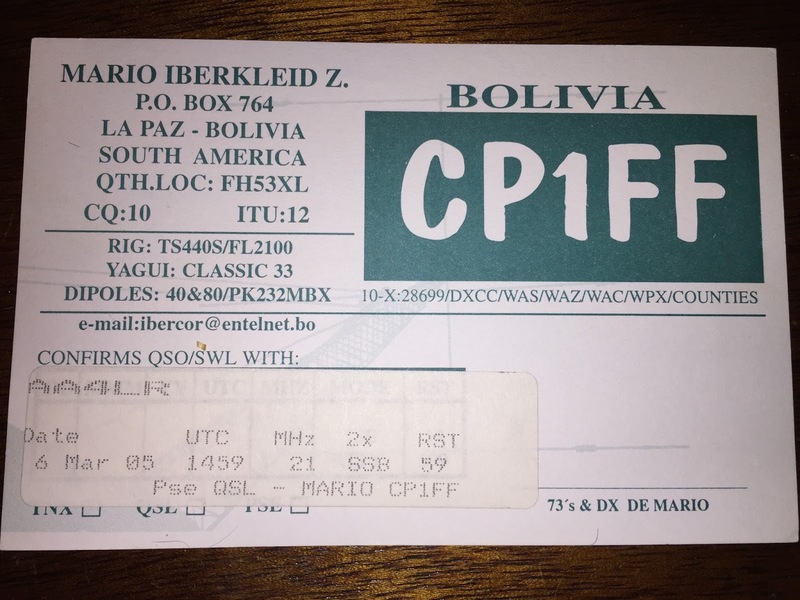 Among the paper QSLs was one for an SSB contact with CP1FF on 21 MHz. I received credit for Bolivia for my SSB contact, so I didn't think much of it. However, in trying to reconcile with ClubLog, I noticed that the credit was apparently entered for 80m instead of 15m. I've never worked CP1FF on 80m. Indeed, I have never worked Bolivia on 80m at all. Why did I have credit for it? A quick email to the DXCC Admin sorted this out right away. She changed my credit from 80m to 15m, as it should be. Thank you!